What can Managing Successful Programmes do for your organization (MSP)? What is different about MSP program and project management? Good e-Learning takes a look at the benefits of MSP at an organizational level. Managing change has become a vital part of modern business. There are always driving forces for change, such as opportunities to incorporate new business processes or technologies, the need to adapt in the face of changing customer expectations, or even compliance issues like GDPR. However, while effective change management can keep an organization ahead of the game, actually pulling it off without a coherent framework is never easy. Program managers have to juggle a range of different factors, including individual project requirements, stakeholder expectations, risk management, resource allocation and team autonomy, all while struggling to maintain a consistent focus on the program’s business case. This is the focus of ‘Managing Successful Programmes (MSP)’, a program management framework originally developed by the British Office of Government Commerce (OGC). It offers users a well-defined yet highly flexible approach to program management; one which has been utilized across a multitude of different industries and in both the public and private sectors. MSP is all about driving and coordinating organizational change by combining projects within a single ‘programme’, resulting in benefits more valuable than what the combined projects would otherwise be able to provide. However, it is hardly the only framework on the market, especially with program management having become such a popular and highly regarded corporate discipline. So, why are so many businesses choosing MSP over its competitors? What are the benefits of MSP, and how can you effectively sell the framework to your organization? Change management is a complicated process. While experienced program and project managers may be resistant to the idea of adopting a new framework, it is often far more economical to invest in a proven method, rather than trying to create your own from experience alone. There is no shame in working from an FAQ - not when you have to juggle this many factors! Luckily, the success of MSP speaks for itself (even if it ‘successful’ wasn’t included in the name). The framework has been tried and tested in a variety of industries across the world. If you are considering using MSP, you will not struggle to find case studies which correspond with your own organization. It is also worth keeping in mind that MSP is not merely a collection of theories for successful program and change management. Rather, it is a collection of best practices based on the knowledge and experience of several provenly successful program managers. When trying to sell MSP to your organization, being able to demonstrate the brass-tacks benefits will be essential. To help with this, many new corporate customers will take a measured approach, upskilling a few employees in order to create a certified project team which can then test the framework on a small scale. Remember, MSP offers a shared language and methodology which will be familiar to all practitioners. Upskilling a team all at once will leave them ready to collaborate and communicate effectively on programs set in an MSP environment. As we have already mentioned, MSP has been widely used across varying industries and sectors. This is possible because, while the MSP methodology is comprehensive, it is also flexible and non-descriptive. This flexibility also extends to the type of programs that MSP can be used for. A practitioner may want to alter the structure of their organization, enable the incorporation of new technology, services or features into their offering, or even ensure compliance. Whatever the end goal of your program may be, MSP can help you reach it. MSP is even flexible enough to be combined with other frameworks if necessary. If your organization already utilizes standards such as PRINCE2, you should be able to incorporate MSP without causing any major disruptions. Managing Successful Programmes provides a level of clarity that is essential to program and project management processes. For one, responsibilities and lines of communication are defined at the start of a program, ensuring easy collaboration throughout (and preventing unnecessary finger pointing if anyone needs to be held accountable at any point). MSP program managers will also clarify the end point of a program at the start of its life cycle, making it easier for project planning team members to create viable roadmaps. Managers will also clarify a program’s stakeholders so that they can be kept in the loop and deliver any necessary feedback. All of this carries several benefits. Most importantly, it can streamline the decision-making process and greatly boost collaboration. By clarifying where autonomy lies in a program, project management teams are also able to make decisions without having to constantly defer to upper management, which helps them to deliver work on schedule. Having a comprehensive program plan is important, but without taking the time to assess potential risks and pitfalls you will still risk wasting resources, delaying work or even causing damage to your organization’s reputation as a result. Risk management is one of the key Principles of MSP. Practitioners assess risks at different levels, both at the start of a program and at several points throughout. For example, someone in a program manager role would organize projects around potential production bottlenecks, or work to ensure a level of a quality that fully meets compliance standards and will not leave customers unsatisfied. Remember, while risk management is fairly standard when it comes to program management, it is not something you want to learn from experience alone! One of the biggest advantages of utilizing the MSP framework is that it encourages practitioners to focus on the long term benefits or outcomes of their programs. This helps to direct and streamline their operations, while also preventing effort or resources from being wasted in the pursuit of irrelevant goals. To help maintain this focus, MSP encourages users to gauge their progress at several points throughout a program. Are the desired results being achieved in accordance with the program roadmap? Are there any issues or risks that require a response before progress can continue? They may even find opportunities to amend or build on the goals that they are working towards, allowing them to enjoy greater benefits once the program is completed. Of course, if an assessment finds that a program is hemorrhaging time, effort and resources, practitioners may also confidently choose to close it down. For a program to be worthwhile, the potential benefits must outweigh the costs. This should be established at the start of a program, with managers providing a clear idea of the timescale and resources required to successfully complete the proposed work. The clarity, control, communication and fluidity provided by the MSP framework all contribute towards making sure that such programs can be completed on time and within budget, without practitioners having to sacrifice quality. At the same time, it is not so prescriptive that the framework cannot be adapted on a case by case basis. This may sound fairly standard, but it is worth keeping in mind just how comprehensive the MSP methodology actually is. MSP practitioners are able to accommodate virtually any factors or risks when planning and carrying out a program, ensuring that their efforts are streamlined, secure and expertly targeted. Why Gain an MSP Certification with Good e-Learning? Good e-Learning is an award-winning online training provider which covers the world’s most popular corporate standards and frameworks, including Enterprise Architecture, IT Service Management, Quality Management and Project Management. Each of our courses is put together by our in-house team of experts, not only allowing us to offer courses at excellent prices but ensuring that students always have access to expert advice. At Good e-Learning, we understand the importance of making e-courses as accessible as possible. To help students in full-time work to juggle studying with their daily responsibilities, we make our courses fully accessible on all electronic devices. This includes computers, laptops, tablets and even mobile phones. We also offer months of course access, making it easy for students to stagger their training around their jobs. While we work hard to keep students interested, we also realize how difficult it can be for those in full-time jobs to manage their studies. As such, not only do we provide course access for several months, but we also make our courses accessible even on mobile devices, ensuring students can stagger their training and access materials whenever they have the time. 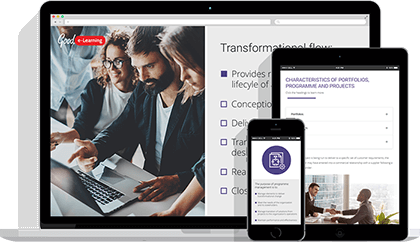 PRINCE2® 2017 Foundation - Become familiar with the PRINCE2 project management principles and practices and how they can be applied to real-world companies. PRINCE2® 2017 Foundation & Practitioner (level 1 & 2) - Pass the PRINCE2 Foundation and Practitioner exams in quick succession in order to become a fully qualified PRINCE2 2017 Practitioner. MSP® Foundation - Become familiar with the processes, principles and governance themes that make up MSP, along with the six MSP Transformational Flow Processes. MSP® Foundation & Practitioner (level 1 & 2) - An excellent fast track for you to earn your MSP Practitioner certification, not only enabling you to make major contributions to programme management within your organization, but also leaving you with a highly valuable qualification. PRINCE2® Agile Foundation & Practitioner (level 1 & 2) - An excellent fast track for students who want to become certified in a highly recognized and valued project management standard and explore the basics of PRINCE2 and Agile, as well as the reasons for combining the frameworks. Want to learn more? View our full portfolio of Project Management courses, or find out more about corporate MSP training!